Your very own, completely private, Colonial Williamsburg-style Cottage near the Bucks County town of Yardley, Pennsylvania, right on the Delaware River. The Cottage is just 13 miles south of New Hope and Lambertville and 25 minutes from Princeton. New York City is a little over an hour away by train (Amtrak or New Jersey Transit to Trenton). Philadelphia is about 30 minutes by car, or you can take a SEPTA commuter train from Yardley. 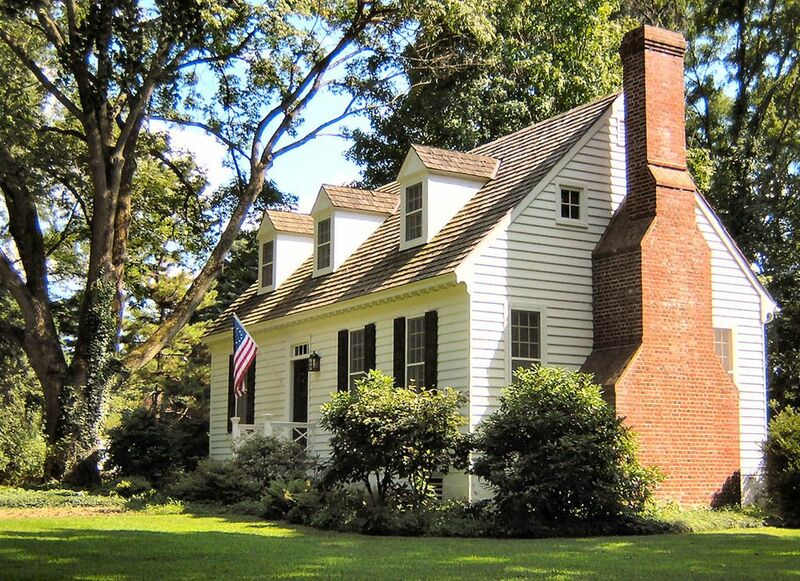 Built by Robert Johnson, a renowned Bucks County cabinetmaker, and furnished with 18th-century reproduction furniture and Oriental rugs, the Cottage is ideal for weekend getaways, week-long vacations, writer's retreats, house-hunting visits, or temporary lodging for relocated executives. As many of our guests have said, this is the perfect place to unwind. The Cottage living space (750 square feet) is quite comfortable for two people. But it also works for a family with one child, or for three close friends who don't mind sharing a bathroom. Because the rooms are small and the floor plan is a bit unusual (you walk through the bathroom to get to the bedroom), we suggest that you contact us first if you're considering reserving the Cottage for three adults, or for two adults and a teenager. There's a wonderful corner fireplace in the living room with raised paneling and a custom-built mantel. The eat-in kitchen is small, but quite serviceable. We've equipped it with everything our guests need to make basic meals and snacks. The main bedroom is furnished with a queen-size canopy bed. The "Tavern Room" off the kitchen provides a twin bed for extra sleeping space. (We don't call this a bedroom because it doesn't have doors or a closet. For a bit of privacy, there are blackout curtains at each of the two doorways, and blackout shades at the windows.) We also have a portable Graco crib and child's booster seat that we can have set up and ready for those traveling with an infant or toddler. The Cottage shares a 3.5-acre riverfront property with our 200-year-old farmhouse. That's where we live and write our books (over 60 titles on a wide range of topics). Most of our books have taught people how to tap into the incredible power of the online world -- starting in 1982! So, of course, the Cottage offers high-speed Internet access (wireless and cable) and HDTV with Netflix streaming movies and TV shows. • Visit historic sites such as the Washington Crossing Museum, the Old Barracks in Trenton, and Pennsbury Manor, William Penn's reconstructed home and farm. • There are lots of award-winning restaurants in historic buildings up and down the river and canal. Most encourage you to bring your own wine or spirits. • For woodland walks and non-stressful hiking, there is Tyler Park in Newtown and the Bowman's Hill Wildflower Preserve on River Road just south of New Hope. • And speaking of New Hope, it's a great place to stroll and to 'people-watch.' But you can also take in a show at the newly renovated Bucks County Playhouse, or catch a ride into the countryside aboard the New Hope-Ivyland Railroad, a classic steam locomotive. • And don't miss Lambertville, the town directly across the river from New Hope. Art galleries, antique shops, great restaurants, the Golden Nugget flea market just down the road... Lambertville is well worth the walk across the New Hope-Lambertville bridge. Need help planning your Bucks County getaway? For 'insider advice' on memorable restaurants and things to do in our area, check Jim Flynn's BestWeekends website. Just go to the site (bestweekends 'dot' com) and click on 'New Hope/Lambertville' in the Country Weekends section. Jim's recommendations are spot on! There really is no place like our 'Bucks County Cottage on the Delaware.' Come visit us soon! Available year-round. No smoking and no pets, please. For last-minute discounts and special offers, please visit our own website (www 'dot' buckscountycottage 'dot' com). Bucks County Cottage on the Delaware is owned and managed by Emily and Alfred Glossbrenner, authors of over 60 commercially-published books with combined sales of over a million copies. We also wrote and published 'How to Make Your Vacation Property Work for You,' the very first book on the subject of do-it-yourself vacation rentals. Every location has its charms, but we have always been particularly charmed by Bucks County, PA. Historic sites, homes, and public buildings dating from the late 1600s on; the Delaware River, teeming with wildlife; the mule-barge canals with their towpath bike trails; European-style restaurants located in old inns; and easy access to New York and Philadelphia by train. Under the circumstances, how could we *not* have ended up buying a 200-year old Bucks County farmhouse on the Delaware River, complete with a rented bungalow, which we later turned into a vacation-rental cottage that we love sharing with guests from around the world. It's like staying at one of Bucks County's legendary inns and B&Bs, except that you have the whole house to yourself. So you can sleep as late as you please, fix your own breakfast in the well-equipped kitchen, and come and go from your own private driveway. You can spend your days relaxing in the living room with views of the Delaware River and a crackling fire in the woodburning fireplace. Or sit outside on the English Garden Bench with a glass of wine and a good book. When you're ready to venture out, just head north on River Road to Yardley (2 miles) and New Hope/Lambertville (13 miles). For more details, visit our website at buckscountycottage 'dot' com. The Cottage bathroom offers 18th-century elegance and 21st-century amenities: gleaming black-and-white tile floor, Oriental rug, stacks of fluffy white towels, custom-built vanity with Corian countertop, traditional brass sconces and fixtures, Japanned looking glass over the sink, combination tub/shower with Corian surround. From the Living Room and Tavern Room windows, you'll enjoy views of the Delaware River, the longest undammed river east of the Mississippi and part of the 'National Wild and Scenic River System.' The riverbank is quite steep in front of the Cottage, and protected by a guardrail, but there are boat launch areas within a mile or so both north and south of the property. Telephone for making unlimited calls within the U.S. High-quality 600-threadcount sheets, fluffy white towels, two terrycloth bathrobes. Williams-Sonoma China and Reed & Barton Stainless Steel Cutlery. Glassware (including Wine and Champagne Glasses). Dining table and chairs for four in Cottage kitchen. Also two booster seats that can be attached to kitchen chairs. LIVING ROOM: 32-inch HDTV with Blu-ray DVD player and Netflix streaming movies and TV shows. BEDROOM: 24-inch HDTV with Blu-ray DVD player and Netflix streaming movies and TV shows. Blu-ray DVD players in living room and bedroom. Thousands of streaming movies and TV shows available FREE via Netflix. Al fresco dining for two at the French bistro table on the back terrace. English garden bench and table in the back yard. Shopping and antiquing in New Hope and Lambertville. Hiking, biking, and birding. Fabulous Bucks County restaurants. Rafting and tubing on the Delaware River. Tours of historic Washington Crossing Park, Bowman's Tower, Bucks County Winery, Michener Museum, and Henry Mercer's eclectically built and furnished Fonthill Castle (1908) in Doylestown. Spend an afternoon in Princeton: Picnic components can be bought at the shops on Witherspoon and Nassau streets, then pick a place on campus to have your lunch. Visit Cottage Club on Prospect Street, where Scott Fitzgerald set a scene from *This Side of Paradise*, stop in at Firestone Library, and don't miss the University Chapel, with its magnificent stained glass windows. Built in the 1920s, the Chapel is considered one of the great masterpieces of American Gothic architecture.